With growing environmental concerns, there has been a shift of consumer choices from synthetic to natural and eco friendly products. One of the smartest ways of adding beauty to homes or an office space is by adding in a lovely seagrass carpet. Available in a myriad of designs, styles, fibres and hues, it is the most sought after option by home decor enthusiasts. Gone are the days of rectangular carpets, technology advancement has also revolutionised the carpeting industry and one can choose from interesting shapes and styles. Seagrass is yet another popular option encompassing the carpet domain in the industry. If you are looking forward to a natural carpeting option for your floors, then seagrass carpet is definitely the ideal choice for you. 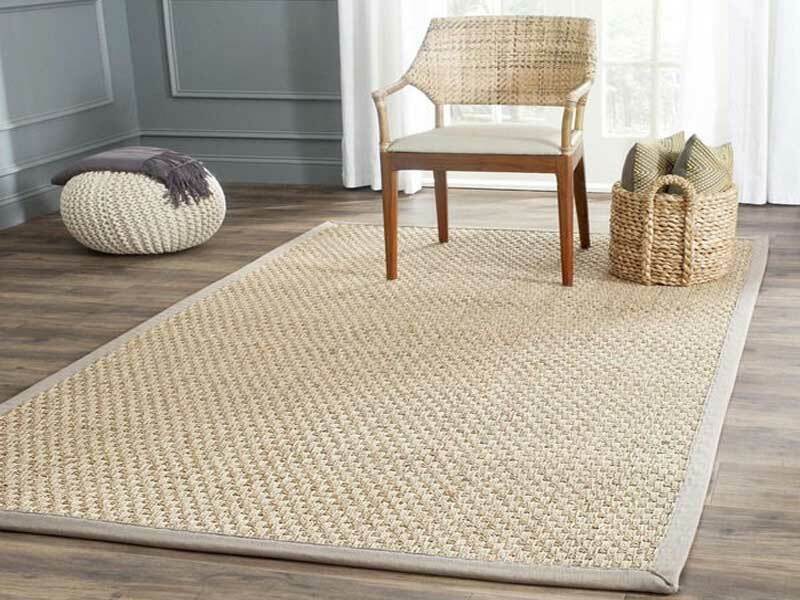 Though there are other options of coir and sisal carpets yet seagrass carpet is still the most preferred option due to its cost effectiveness and durability. Seagrass is an all natural plant that grows in the paddy field of China and India. Flooded water in these fields favours the growth of seagrass. Once fully grown, the seagrass are cut and dried in the sun. The dried fibres are spun into cords which are then woven to make rugs, carpets and distinctive other useful products. The natural finished smooth and shiny appearance makes it an ideal choice for hallways, living room, a kid’s playroom or office indoors; however, it is recommended to not to use it on stairways to prevent slipping. Sea grass carpets are durable and last for an extended stretch of time. It can withstand high wear and tear and thus is a good choice for high traffic areas like hallways, living room or your kids playroom. It is amazingly stain resistant, so you can expect minimum or no stains over it; you can also choose from seagrass carpets having stain guards that the manufacturers put into its making for increased resistance to dirt and stains. Since seagrass carpets are made of natural products and doesn’t require any chemicals in its manufacturing, it is absolutely pollution free and environment friendly. Furthermore, the distinctive shades of seagrass minimises the possibility of any dying in its creation. It adds the shiny gleam to your floor spaces. Its looks strikingly beautiful wherever it is placed. Also, the variety of designs, patterns and styles can be chosen to fit into the theme of the room. Owing to the molecular structure of the seagrass fibres, it is naturally sound absorbing. Thus, you can sleep soundly in your bedroom or study with full concentration in the seagrass laid study room. Pricing is a key factor when it comes to consumers choices. Amazingly, despite endowed with so many benefits, seagrass carpets are considerably economical and can be purchased at the most affordable prices. Its inexpensiveness gives it an upper hand over the synthetic alternatives. Seagrass carpets require low maintenance. Few shakes are enough to ward off dust or dirt, however, it is recommended to vacuum it with a suction pipe to give it long lasting life. It does not trap dust or dirt like other carpeting usually does. It is anti allergic. In case of you have member at home who is suffering firm asthma or respiratory problem, you can be relieved by installing seagrass carpet at home. A word of caution will entail not installing it in outdoor areas like front entrance. This is because it gets damaged by rain or snow. Constant exposure to moisture or spillage damages its fibres. So, choose from the vast collection of Floorspace seagrass carpets to bring the aesthetic appeal to your room suiting your lifestyle and exquisite taste.